et me tell you about a breathtaking world. It is a tiny place full of life that is constantly changing and growing. Developed by a small group of people, Hemisphere Games, here is something you are not likely to forget and it will only cost you $10. 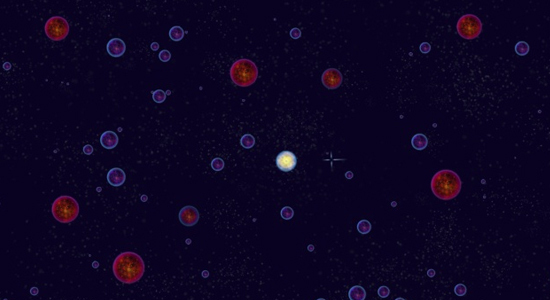 Osmos is a game about life existing in a strange, but familiar harmony. Part Katamari or Spore, and a billion parts of truly original fun — Osmos is a splendid display of science as an art form. It is built around the concept of osmosis, that fluid can be absorbed through a membrane that encompasses something. In the case of Osmos, that something is a small, round life form called a mote. Every mote for itself.Training teaches the player how to move the mote by moving the cursor to the desired direction of propulsion. By shooting bits of its own matter, your little mote propels itself in any direction. But beware the other surrounding motes. Anything larger than you turns a menacing red until you absorb enough smaller motes to outgrow them. Then it's every mote for itself. Momentum is this game's biggest concept and if you do not have a tight, intuitive grasp on it, you will after diving into this game. Thus is the reason Osmos opens with Newton's third law of motion which states, "For every action there is an equal and opposite reaction." By learning to propel the mote by shooting a projectile in the opposite direction, the mote can navigate tricky areas, dodge enemy motes, and even produce quick bursts of speed (and an equivalent loss of mass) to catch up with its prey. There is so much to this tiny world that surges with round, fluid-filled beings. Some can grow with the intent to chase down your mote, and not for the purpose of making friends. Others act as anti-motes and must be avoided at all costs. In between are bio-phobic motes that are tricky to hunt down, and motes that seem to undulate with other forms of life inside them. My favorite levels involve the Attractors, which function like brightly shaded black holes amidst the sea of motes. A thin grey line plots your mote's current orbit. After a bit of experimenting, and lots of mass flying in various directions, I found that the orbit turned red and it projected my final destination inside the Attractor. A quick adjustment easily stabilized the orbit, which became very easy to manipulate once I understood that physical relationship between momentum (mass times velocity) and the gravity-like attraction between my mote and the Attractor. It seems far more complicated than it is. Challenging, but not frustrating.Considering the challenges presented, Osmos is not one bit frustrating. I credit that to the simplistic nature of the game, the very ethereal feel to the design plus a soundtrack that serves as a soft cushion to help you stay comfortable yet focused. It all adds up to something otherworldly and just . . . incredible. Early on it becomes clear this is not a race against time; in fact, you can alter the progression of time to your liking. It is a relaxing, meditative experience about going with the flow. It is about being clever and letting things happen in order to see the result. This is, beyond doubt, a work of genius. You will not find anything akin to a story, but with this style of game it isn't exactly necessary. Nor is there multiplayer, but that would muddy this "gaming on my time" experience. I cannot find a single thing wrong with it. Nothing upsets me, and nothing makes me want to stop playing. There are some very difficult challenges far down the line of unlocked levels, but I keep trying new things — and isn't that the purpose of games? To view something from a different perspective?